In September 2016, the German drugs and chemicals group Bayer announced its intention to acquire the multinational Monsanto, known for its Roundup herbicide and GMOs. This merger would produce the world’s most powerful company in the seed and pesticide industry and lead to serious repercussions for our food security as well as our capacity to steer European agriculture towards a more sustainable and less toxic model. If the European Commission approves this merger (a decision is expected to be taken by early April), the outcome will be the creation of the most powerful company in the world in the seed and pesticide industry. The consequences of this are likely to be a sharp decline in crop diversity and food diversity, but also a concentration of the patents relating to the very basis of our food within the hands of a very small number of multinationals. 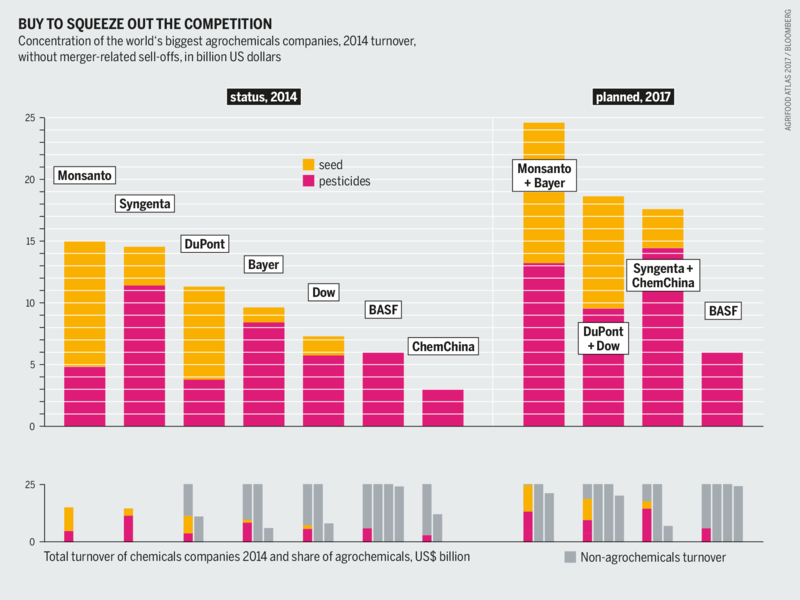 Among the most enduring myths concerning the European agro-food industry is the notion that seeds are produced largely by small and medium-sized companies. This image has long been touted by the European Commission (and notably by its Health and Food Safety Directorate-General, DG SANTE), which claimed up until 2013 that nearly 70 per cent of the market was covered by small and medium-sized businesses. Since then, thanks to the obtaining of alternative metadata to that provided thus far by the industry itself, it has been possible to observe that it was nothing of the kind. In fact, by virtue of buyouts, investments or trade agreements, the seed industry is one of the most concentrated in the European Union, a fact that was highlighted in August 2017 by the preliminary analysis produced by the Commission’s Directorate-General for Competition, examining the planned Bayer-Monsanto merger. 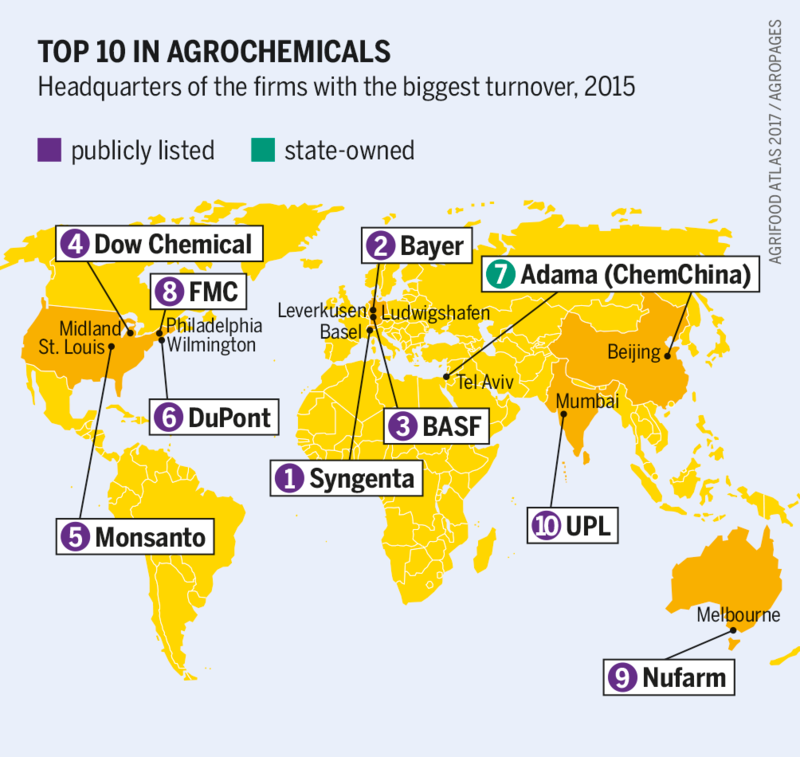 This phenomenon has persisted over the past 25 years on a global scale, and recently culminated in the merger of the giants Dow and Dupont, followed by the takeover of Syngenta by ChemChina. In 2014, just four companies – Bayer and Monsanto among them – controlled close to 95 per cent of vegetable seeds in the EU. This trend is not only happening vertically (with big seed companies taking over smaller ones) but also horizontally. Bayer and Monsanto are also heavyweights in the plant protection industry and market two of the most popular herbicides in the EU: glyphosate and glufosinate ammonium. Together, they would hold 24 per cent of the world pesticide market and 29 per cent of the world seed market, according to the European Commission’s evaluation. It is striking that these same companies (most of which emerged from the big post-war chemical industries) provide farmers in so-called ‘developed’ countries with a significant part of the input supplies required for their production: seeds, fertiliser, and pesticides. It should be noted that Bayer also markets veterinary products through its pharmaceutical branch. The balance of power between its industries and their clients is thus extremely unequal, particularly as a hardening of regulation severely limits the capacities farmers currently have to produce their own supplies. The near-total absence of competition [read more on competition and the merger] in this industry with its captive market generates a significant rise in agricultural input costs, which rose on average by almost 40 per cent between 2000 and 2010, while farm gate prices (prices paid to farmers for their goods) increased on average by less than 25 per cent, according to Eurostat. But it has also contributed to a rather staggering decline in the range on offer. The diversity of seeds sold and used by EU farmers, that’s to say in the fields and on our plates, has fallen drastically in parallel with the development of the seed industry. Today, breeders in this industry only work on 137 different crops (among the 7000 domesticated plant species), but this number doesn’t represent the reality. Indeed, 16 producers make up 86 per cent of global production, and maize (primarily intended as feed for livestock) alone receives 45 per cent of all private research and development investment. Nevertheless, it would be a mistake to attribute this trend to concentration alone, since the decrease in seed diversity is partly inherent to the ‘professionalisation’ of the industry. The investment necessary to produce a commercial variety, register it in the seed catalogue, or even patent it, requires a return on investment considerably easier to ensure with crop species cultivated over large areas, such as maize. This holds even more true for genetically modified species, for which the cost of development reaches on average 136 million dollars. We are witnessing a phenomenal impoverishing of crop diversity and of our food diversity, which has serious implications for our food security, in both quantitative and qualitative terms. Focusing on such a small number of crops means running the risk of incurring devastating consequences if a disease or pest were to develop. The case of phylloxera, an insect which ravaged European grapevines in the 19th century, is not so distant. It was only tackled thanks to the contribution of various resistant species which were still being cultivated. This is also a public health problem: the biofortification of food and crops is regarded as the new magic solution to tackle problems of nutrition… problems that would not exist if food diversity had not declined so sharply. This model is of course to be contrasted with the system of small-scale farmer or participative selection, which still provides 80 to 90 per cent of the world’s seeds at an extremely reduced cost, all while working on several tens of thousands of crop varieties. 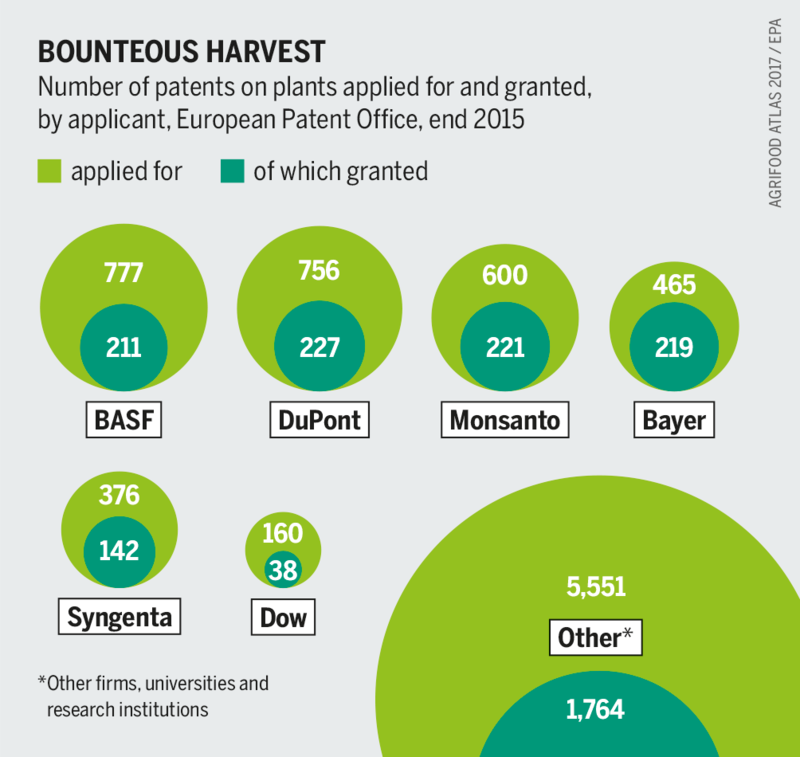 The continued merging of companies in the seed industry also leads to the concentration of the patents related to crops in the hands of a few actors. 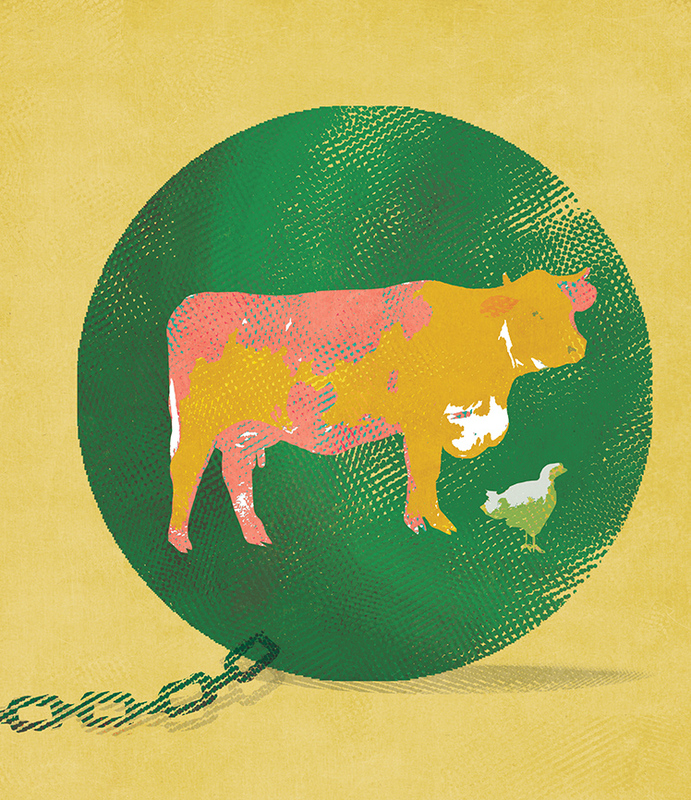 Firms in the agro-chemical industry have a clear strategy – frequently denounced by NGOs – aiming to patent the largest number of species or traits possible, even those emerging from classical cross-breeding. In 2015, around a hundred requests were registered by the European Patent Office for seeds produced through classical cross-breeding. Certain companies even tried to patent seeds that had been developed previously by their competitors (without being patented), or that were naturally occurring in the environment. Privatising nature in this way is not only problematic from a moral point of view, it also carries more fundamental dangers. Patenting makes no allowances for research and development, making it impossible for small seed firms or farmers to use species or traits under this protection to develop new seeds – unless of course they are prepared to pay royalties to the owner of the patent. Such a tax on innovation is extremely damaging to our capacity to develop seeds adapted to the conditions of our changing climate, or to societal demands – notably concerning the environment. In developing countries, where agriculture is primarily based on the reproduction of seeds by farmers themselves, it’s the capacity to produce full stop that is threatened by this system. Few mergers have triggered such intense debates as this one. Monsanto’s bad reputation plays a part in this of course, but it doesn’t explain everything. This operation has united an unprecedented alliance against it, consisting of agricultural organisations (European as well as North American), concerned it will worsen the already highly unequal balance of power between farmers and agro-chemical companies, as well as of environmental NGOs, who view it as a means of creating a ‘supper-lobbyist’ in favour of industrial farming. But it’s also – and above all – a danger for our food security in the medium term, which the authorities should not neglect when it comes to approving or rejecting the plan. In the medium term, curbing the concentration of the agro-chemical industry will not be sufficient to counter the erosion of our capacity to produce our food, in terms of ensuring both quantity and quality. It’s the entire agro-food system that needs to be revised: it must be made more adaptable, more resilient, more innovative, less resource-hungry, and produce less of an impact on the environment. It must also allow farmers to making a living from their work. This is the model the EU should have in mind when it comes to reforming its Common Agricultural Policy [read more on the reform] , a model which is not beholden to the ambitions of the agro-chemical giants. Technological advances, demographic shifts, and a shortage of caregivers mean that huge change is in store for the European healthcare system. But what does this mean for the healthcare workforce?